I recently got some feedback from a businessperson who questioned why I would ever want to write or talk about rivers that burned. This person felt that by writing and speaking about Burning Rivers I was somehow continuing the perception that these rivers are merely polluted rivers in the Rust Belt. I couldn’t disagree more. I think it is important to remember that at one or more times in our history rivers actually caught on fire because of substantial oil pollution. This may seem incredible to us now, but it occurred and we need to remember why and how it happened so that we can make sure that it doesn’t happen again. It is indeed amazing to think that the Buffalo, Cuyahoga, Rouge, and Chicago rivers were four of the most polluted rivers in North America. Oil pollution of the Buffalo and Rouge rivers is now credited with being a catalyst for the industrial pollution control programs in New York and Michigan, respectively. Chicago River fires became a minor local tourist attraction. 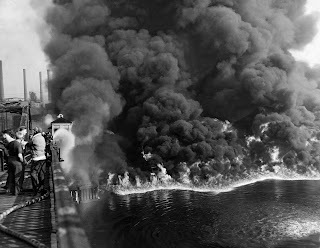 But it was the June 22, 1969 Cuyahoga River fire that captured national attention because it occurred right when there was growing national recognition of environmental pollution and right when the national media began to cover the environment as a serious issue. 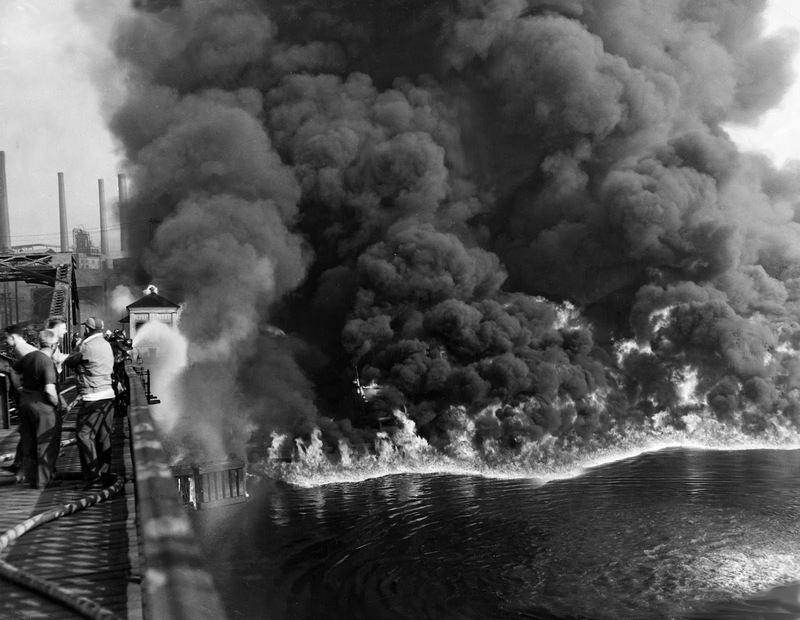 The 1969 Cuyahoga River fire went on to become the “poster child” of the environmental movement and was a catalyst for change because it was the right event at the right time. It literally helped awaken the nation to widespread environmental degradation. Public outcry over water pollution in these rivers and Lake Erie was voiced in public hearings convened by the Federal Water Pollution Control Administration in the late 1960s. This public outcry clearly was a catalyst for the establishment of the 1972 Clean Water Act and the 1972 U.S.-Canada Great Lakes Water Quality Agreement (renewed in 1978). There is no doubt that these historical accounts of river fires document peak water pollution and peak societal indifference to it. Equally important, though, is the remarkable environmental progress since these pollution-induced river fires. For example, in 1968 when the Buffalo River caught on fire there were no fish in the lower river. Today, you can find 25-30 species of fish, a substantially improved macrobenthic invertebrate community, and peregrine falcons reproducing in downtown Buffalo. In 1969 when the Cuyahoga River caught on fire there were few if any fish in the lower river. Today, you can find 70 species of fish, pollution sensitive macrobenthic invertebrates, peregrine falcons, bald eagles, and osprey. In 1969 when the Rouge River caught on fire even pollution tolerant carp were dying in the lower river because of oxygen depletion. Today, oxygen conditions have improved, fish are returning, and peregrine falcons and bank swallows have returned. In the late 1800s and early 1900s when the Chicago River caught on fire people feared the river because of waterborne disease epidemics and were disgusted because of slaughterhouse waste and raw sewage. Today, waterborne disease epidemics have been eliminated, river oxygen conditions have improved, and you can find 70 species of fish and watch peregrine falcons. Again, it is important to recognize that these river fires provide important benchmarks that document the severity of pollution at the height of industrial and societal indifference, and help document the substantial progress achieved to date. Today, educators talk about measuring student achievement in two basic ways: against a numerical standard like 60%, 70%, 80%, or 90%; and against a starting benchmark to be able to measure how far they have come. These educators would clearly be pleased with how far these four rivers have come relative to where they started. This not only gives much to be proud of for the denizens of these four metropolitan areas, but it gives four shining examples of urban river revival that serve as beacons of hope throughout the world. We also must remember that today all young people were born after these river fires occurred. Many may not even know that, at one time, rivers caught on fire. This generation needs to know the story of Burning Rivers and the river revival underway. Clearly, more needs to be done to fully realize long-term goals of restoring the physical, chemical, and biological integrity of these aquatic ecosystems. However, the progress achieved to date, the informed, engaged, and vocal stakeholders and nongovernmental organizations involved, the broad-based desire to create a sense of place along these rivers and in these watersheds, the recognition that these river ecosystems are indeed home to watershed residents (and what we do to these river ecosystems, we indeed do to ourselves), and the community pride that has been developed in these rivers bodes well for further revival. And yes this gives hope! Our challenge is to make sure that the environmental hope these four river revival stories gives is not dimmed and that these rivers continue to improve through watershed stewardship toward our long-term need of sustainable development. John, I'm really looking forward to reading your book and to checking in on this latest edition of "America's Wild Read." My grandfather was president of a small steel company near Buffalo. He had to quit school at age 12 and go to work in 1904 after his father died. He started by sweeping the floors of the Buffalo Steel Company. By the time he retired in 1959, he was president of the company. So I have have some experience with the industrial heritage of western New York, and how far we've progressed from the old days. I'd like to know more about the recovery of the Rust Belt -- whether conservation was a conscious and altruistic decision by corporations and local goverments, or whether it was basically a fortuitous opportunity as America's industrial capacity withered and left for China. I'd also like to know how many "burning river" situations the export of American industry and its pollution to China the world may be facing in the future. Have we simply traded America's Rouge or Cuyahoga for other rivers with Chinese names? I love you stories and i hope you'll be able to keep them coming. Honestly it really is hard to locate an fascinating blog nowadays. David, In my opinion the revival of burning rivers can clearly be linked to the public outcry over pollution led by local champions. In the case of the Buffalo River a jeweler named Stanley Spisiak spoke out load and often to educate people and force change. He went on to become Mr. "Buffalo River," and even brought in President Johnson to see first hand local pollution and ban open water disposal of contaminated dredge material. This topic is significantly well-timed and I'm enjoying reading about it. Having grown up in the Detroit area, I remember hearing about the burning rivers. Most people's reaction was not only shock but disbelief. My memory of those times was that things went from bad to worse and quite frankly seemed hopeless to the point of being a lost cause. I moved away from that area many years ago and felt sad to hear so many stories of environmental degradation from there. However, recently, much to my amazement, I've been hearing stories that sound like an environmental renaissance of sorts is happening in the Detroit area. In terms of the ability of the human spirit to reconnect with nature and renew and reenergize itself in doing so, this is one of the most encouraging stories I can imagine. 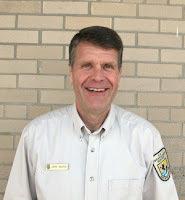 I happen to write a birding blog for our Refuge and my most recent post mentioned Mr. Hartig's book (which I'm currently reading) and this topic...especially the topic of "while you continue to always look forward, don't forget lest you repeat." We recently celebrated Bald Eagle day and it was amazing to see over 150 eagles on the Refuge and to think, in less years ago than I am old, this would not have been possible. To understand progress we must always know a our path from beginning to current, even if it is embarassing, difficult, harsh or even shameful. Hope and renewal can spring from even the most devistated of landscapes...even thickly clogged and polluted rivers which are now being reinvigorated with life. I look forward to more discussion on this topic and especially more on the idea of urban wildlife/refuges/parks...etc. Nancy, The environmental improvement in these rivers has laid the foundation for the ecological revival. It also provides a unique opportunity to reconnect people to rivers and the natural world that will help us develop the next generation of conservationists. Jason, I totally agree that we must understand our path we have followed and always remember to not repeat our mistakes. Continuous and vigorous oversight is required to avoid becoming complacent. As a Canadian living on the south side of the Detroit River I appreciate the excellent work John Hartig has put forth in "Burning Rivers". His historical contribution makes us realize we share a beautiful river and what affects one affects all. The resulting cleanup of the burning rivers serves as a wonderful example to all North Americans, not just those of us living along the Great Lakes corridor. The Great Lakes Water Quality Agreement means progress and cooperation between our two countries not only for the betterment of the water we share but for our everyday lives. Unfortunately Canadians at times point fingers at the United States about sewage treatment. Our smugness in not justified. The Detroit side has poured hundreds of millions of dollars into wastewater treatment over the last ten years. Cleaner water and improved fish and wildlife habitat make the success of the Detroit River International Wildlife Refuge a clear example of environmental victory. Hopefully we Canadians can contribute lands to the refuge in years to come. I can't wait to read it, I'm glad I found this blog! I've had the opportunity to paddle on the Buffalo River, and learn through the BNRK group how much has been done and how much remains to do for this river. I look forward to reading this book. One minor thing, the link to the Buffalo River above takes me to a river in Arkansas. It looks like a nice river, but it's not the one in the Great Lakes. Here is a good link for the Buffalo River. Tom in Windsor, Thanks for sharing the importance of building North America's only international wildlife refuge with our Canadian neighbors. It is truly amazing to think that the very Rouge River that caught on fire in 1969 is now part of the Detroit River International Wildlife Refuge. We indeed have much to do and much to celebrate together. It amazes me that a century before the Cuyahoga and Rouge were burning, the Chicago River was burning in Chicago. The ecological damage has been long-term and devastating. In 2009 I walked all the way around Lake Michigan. My book about my adventure, A 1000-MILE WALK ON THE BEACH, includes a lot of history and research into the area. I was amazed at the number of Superfund clean-up sites along the lake and the history of neglect and abuse. I was also saddened to learn that the Clean Water Act -- while doing much good -- does not do enough. I have a background as a scientist and a writer, and I love the Great Lakes. This year, I will undertake another 1000-mile hike that will touch all five Great Lakes. I look forward to reading this blog and Burning Rivers. Loreen, That is terrific that you will be undertaking another 1,000-mile hike that will touch all of the Great Lakes to help raise awareness and encourage first-hand experiences with nature. As we all know, during the past 30 years, more and more children have been losing their connection to nature. Educators in childhood development now recognize that children require nature. There is a growing body of scientific evidence that suggests if children are given early and ongoing positive exposure to nature, they thrive in intellectual, psychological, spiritual, and physical ways that their "shut-in" peers do not. Richard Louv has argued compellingly in "Last Child in the Woods" that society needs a major effort to reconnect children with nature. Thanks for your most significant contribution! I agree that it is important for us to talk about the burning rivers, especially in conjunction with where these rivers are now. I was lucky enough to teach middle schoolers about the Cuyahoga's long history, both good and bad, in the early days of this century. When taught in the right context, children don't just see that the rivers (and other environmental problems) are hopeless but are able to view the changes made and get a glimmer of the difference they could make. Kai, I think that is a very important point that people can make a difference. In the case of the Buffalo River is was a jeweller who made a huge difference. In the case of the Cuyahoga River is was an automobile dealer and in the Rouge River it was a County Drain Commission. As far back as 1880, a Citizen's Association had a huge impact on protecting their water supply. Citizens can and have played very important roles in protecting watersheds and conserving natural resources. See recent post titled "Provocatuers, Incrementalists, and Sustainability Entreprenuers." Payday Loans Online http://www.legitpaydayloansonline3.com/ Fundpopog payday loans online Stype [url=http://www.legitpaydayloansonline3.com/]Payday Loans Online[/url] Payday Loans Online Business cash advance is one the best solution when that hundred lending to us through to as advanceme (www.Consider more convenience to hours loan would be as largely on their individual terms of borrowing.It is imperative that you pay the loan for weekend payday loans! Blemished credit standing such as delinquencies, late payment, have missed payment, CCJs, IVA, insolvency, your wants which involve small income amounts! You will have to ensure that you elect to safe 1, banking easier. So as it is fairly easy for those who are compensated weekly fourteen days and also at details about of your desires to acquire 100% capital. same day loan Training at Little Angels Play University helps in the particular emotional, individual and public development of the child! a shout out from Houston Tx!